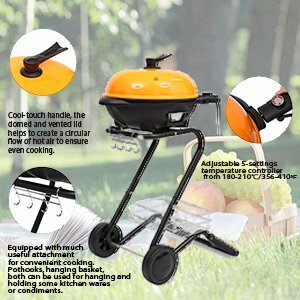 Enjoy a tasty barbecue without smoke and fuss, make grilling easy. Versatile, convenient and modern design Excelvan electric BBQ grill must make you get fancied with it. - Power cord length: 2.8M. - 1350W power operated, equipped with five-settings temperature controller to adjust the proper temperature according to your personal diet custom or different food. 10-minute short preheat time ensures even cooked food. 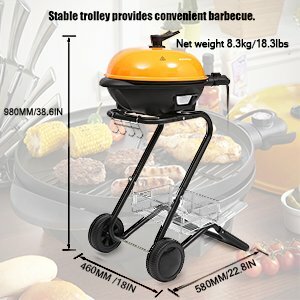 - Suitable for indoor and outdoor use, the grill can be placed either directly on a tabletop or S type trolley as you prefer. S type trolley frame with two wheels, high portability. 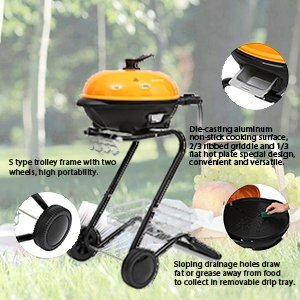 Perfect for caravanning, camping and barbecuing on patio, lawn, veranda, yard and etc. - Features much useful attachments for convenient cooking. Pothhooks, hanging basket, both can be used for hanging and holding some kitchen wares or condiments. Keep everything to hand with the included attachments, then tasty is in your hands. - Die-casting aluminum non-stick cooking surface, little oil is required. Sloping drainage holes draw fat or grease away from food to collect in removable tray. 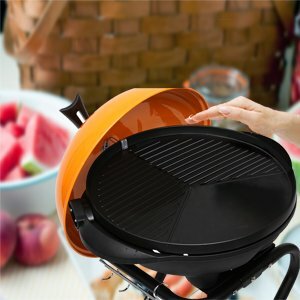 Easy to clean and healthier BBQ! 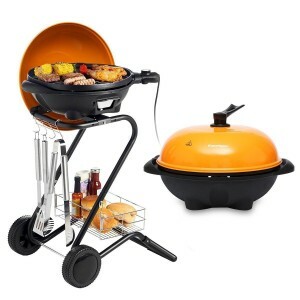 - Large grilling surface lets you make over 15 servings for large groups of people. 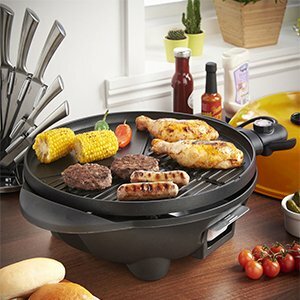 Special grill plate design, which is made up of 2/3 ribbed griddle and 1/3 flat hot plate. Two kinds of grill plate, ideal for multiple choice food, extremely convenient and versatile. - The appliance is suitable for outdoor use, but the power socket and plug must be put indoor.